If you live in one of the nine cities where local Gen2Gen campaigns are active, connect with your local campaign below. If you’re interested in starting a local Facebook group or a local campaign, contact Karimah Nonyameko, [email protected]. Gen2Gen Boston, powered by the Encore Boston Network, believes that adults 50+ have the time, talent and motivation to help kids get a strong start in life. With a group of partners and affiliates, Gen2Gen Boston works to connect this largely untapped, rich talent resource with organizations that are making a difference in the lives of young people. Gen2Gen Cincinnati — a regional innovation partner in Gen2Gen’s national five-year campaign — believes that older adults who have the time, talent and experience can be one of our greatest assets in tackling some of the critical challenges facing children in our community. Gen2Gen Cincinnati engages these adults looking for a meaningful encore endeavor and connects them with youth serving organizations in our community to address our city’s overwhelming childhood poverty rate through tutoring, mentoring and other shared educational experiences. Gen2Gen LA is a federation of leading Los Angeles youth development agencies and service organizations representing older adults who have a shared commitment to recruit and deploy older, wiser and experienced adults to help them carry out their respective missions to benefit young, underserved children. This intergenerational initiative is focused on actively engaging culturally diverse 50+ adults to work with children (up to 8 years old) in underserved communities across Los Angeles County. San Diego County’s mission is to plan, implement and sustain meaningful partnerships across generations to address health and social issues. Committed to the Live Well San Diego vision, it aligns the efforts of individuals, organizations and government to help all 3.3 million San Diego County residents live well by viewing all community efforts and challenges through an intergenerational lens. Gen2Gen San Jose. In partnership with the mayor’s office and through various City volunteer programs and youth-serving organizations, Gen2Gen San Jose seeks to set a new standard for community involvement, by engaging adults 50+ to help tackle the city’s toughest problems. The older generation will specifically help youth and children, promoting these services as a core part of what it means to be a citizen in the most innovative city in the world. 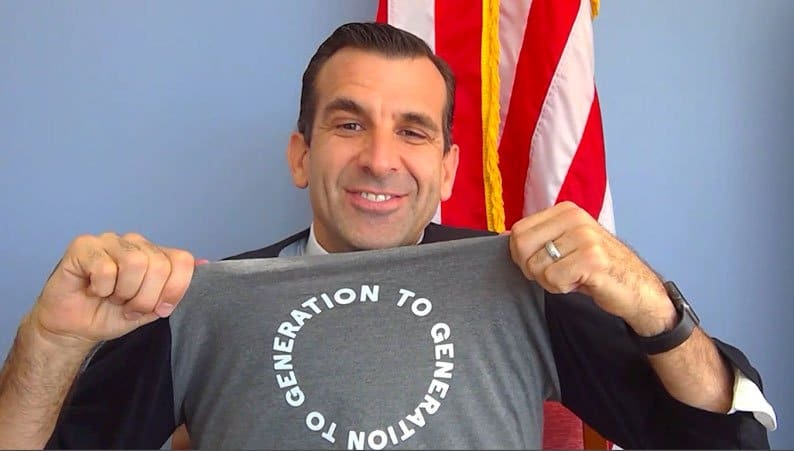 Gen2Gen San Jose will serve as a conduit for adults 50 years and older to connect and find youth serving opportunities, to unleash their spirit of service, empower their creativity and leverage their professional expertise. Gen2Gen Seattle focuses on education equity and mobilizes adults age 50+ to improve the lives of young people in vulnerable situations, reinforcing the interdependence between older and younger generations. The Gen2Gen Seattle movement is hosted by 501 Commons, formerly Executive Service Corps of Washington, with a mission to boost the capacity of nonprofit organizations to thrive over the long term and effectively serve the community. Click here to learn more and stay in touch with Gen2Gen Seattle. Gen2Gen Tampa Bay, powered by Encore Tampa Bay, works to bring the community together to improve outcomes for people, young and old, and to strengthen local organizations serving both populations. The mission: to mobilize midlife, experienced adults to improve the lives of the most vulnerable children and youth in the greater Tampa Bay community. In partnership with Seniors in Service/RSVP, Gen2Gen Tampa Bay, is working to engage older residents to tackle some of the toughest challenges in the South Hillsborough County by using their skills and passion in various volunteer and capacity building roles.